Easter Island sits in the south Pacific, directly west of Chile, and is known for the hundreds of enormous carved heads that are scattered all over the island. 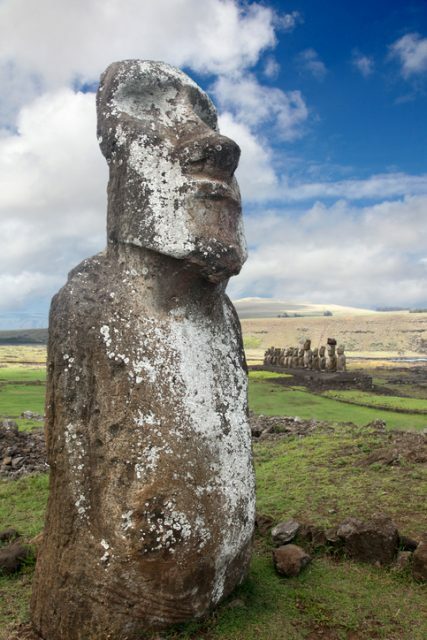 The mysterious statues, or Moai, have puzzled outsiders for a long time. How were they made? Why are they scattered in seemingly random places around the island? What was their purpose? A team of archaeologists from UCLA have been exploring the statues and trying to find the answers to many of those questions. Jo Ann Van Tilburg founded the Easter Island Statue Project (EISP) in 1982 and has been its co-director since 2000, along with a Rapa Nui colleague, Cristian Arevalo Pakarati. 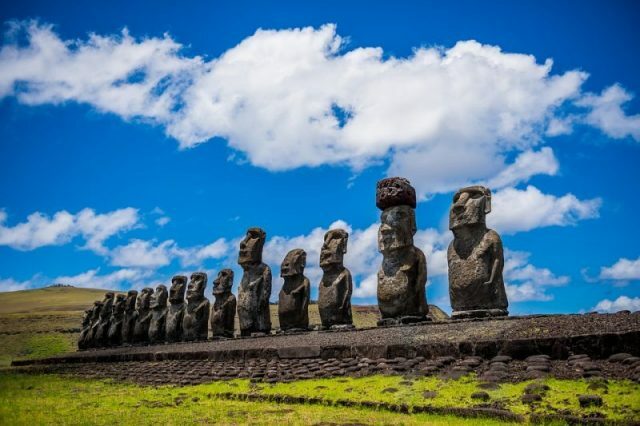 The goal of the project has been to survey, map, excavate, and ultimately save and preserve the statues, with an eye toward better preserving Rapa Nui culture. 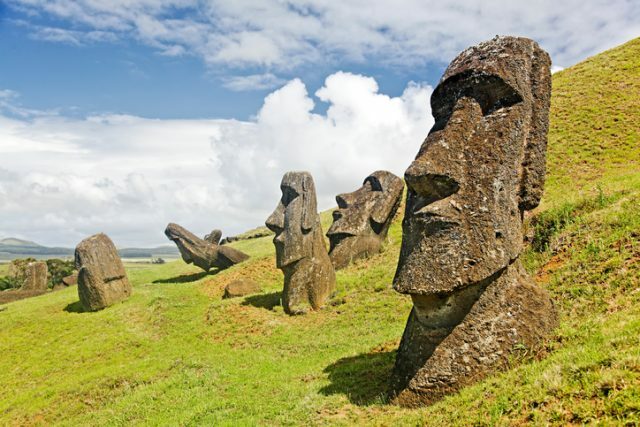 According to Trevor Nace, a geologist writing for Forbes, the Moai, which are carved from native stone found on the island, were created between 1100 and 1500 AD. 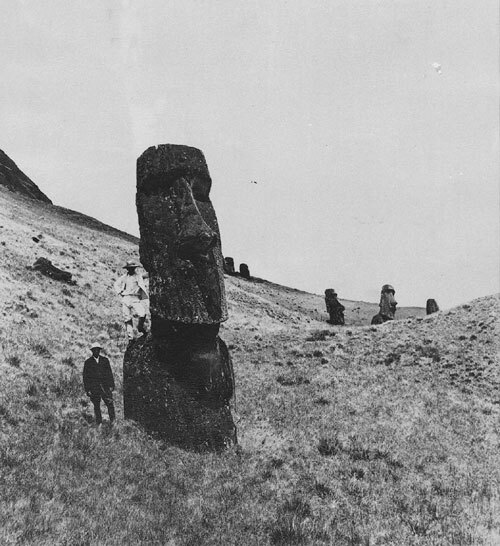 One of the things that the team discovered in the course of their work is that the Moai aren’t just heads. The statues also have bodies, which have become buried by rocks and sediment from natural erosion on the island. 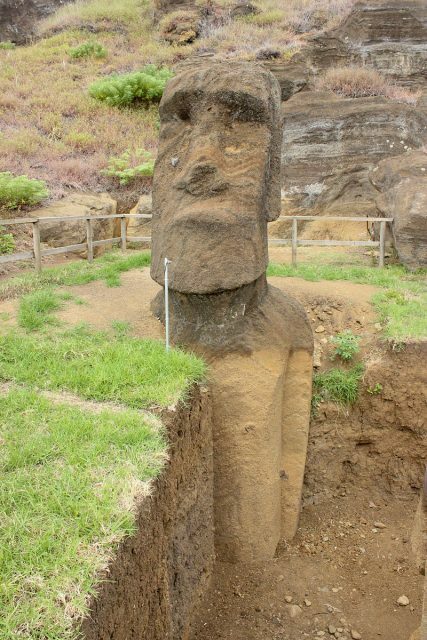 Being buried helped preserve the lower parts of the statues, as Van Tilburg’s team discovered when they began excavating several of the Moai as part of their work. Moai at Ahu Tongariki by the Rapa Nui people, Easter Island, Eastern Polynesia, Chile. After getting the necessary approvals, the team excavated around two of the statues, revealing long bodies which had been truncated at the waist. They’d been covered by huge shifts of sedimentary material over the course of centuries that completely buried the torsos, leaving them safe from the deterioration the heads experienced from being exposed to the weather. Easter Island is volcanic, and was formed by flows of basalt and andesite. Besides those minerals, the island also has tuff, which is volcanic ash that has been compressed into stone after being expelled from the volcano. This tuff is what the statues were carved from. 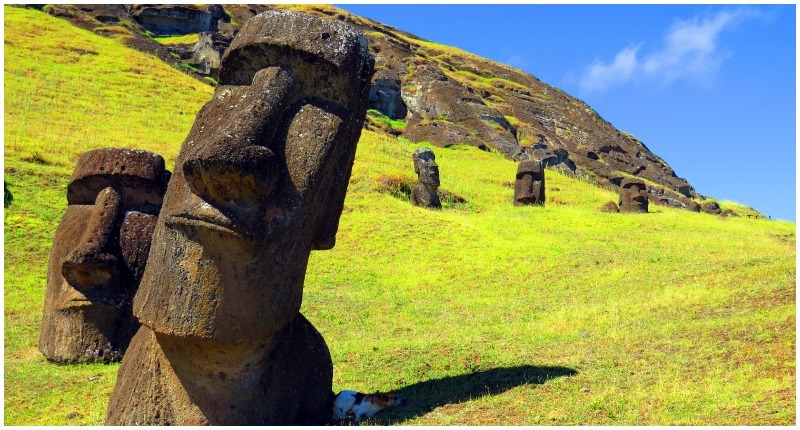 Most of the statues are located close to the volcanic cone the Rapa Nui used as their quarry, but there are plenty of other Moai around the island. The UCLA Newsroom reported that Van Tilburg was surprised when she posted pictures of the excavated statues on the EISP’s website and was flooded with excited emails by people who had no idea that the giant heads also had bodies. She said that after she thought about it, though, it began to make more sense to her, since most of the pictures available in books or on the internet are of Moai on the slopes of the volcano, which were generally buried to mid-torso, so that only the heads are apparent. About half of the Moai have been placed around the island at various sites, but the rest remain clustered around the volcano where they were carved. Of the 149 statues that are upright at the quarry, attempts have been made to excavate about 90 them. None of the previous attempts had ever been done so methodically as the two done by Van Tilburg’s team, however, or documented to an archaeological standard. Along with the bodies themselves, the team also found some evidence of the method the islanders used for getting the statues upright. Raising the statue would have been no mean feat, since one of the statues they excavated was about two stories tall. Van Tilburg said they found a very deep, round posthole, into which the statue’s creators could put a tree trunk. Ropes were then attached to the tree trunk and the statue, and the trunk was used to raise the statue. Evidence suggested that the front of the statues were carved while they were lying on their backs, and the rear of the statues were completed after the monoliths were upright. Finally, the team also unearthed a burial site next to a statue, which, in addition to the human remains, had a large amount of red pigment within it, which suggests that the red paint used on the statues was also used during Rapa Nui ceremonies, such as burials. Van Tilburg believes that, because they have found burial sites clustered around the giant carvings, it’s likely that the dead were buried around their own family statue. 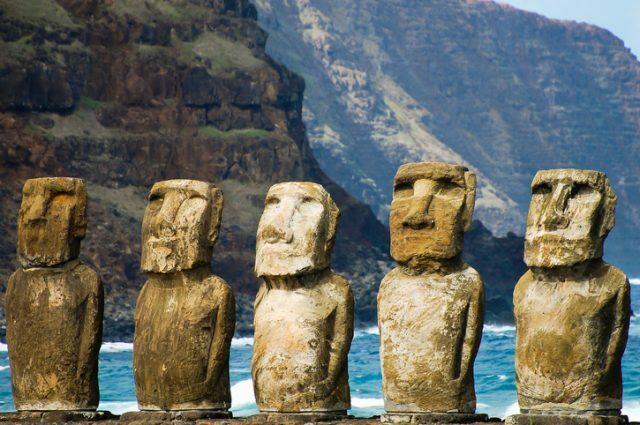 There are still many things that remain unknown about the ancient Rapa Nui and their culture, but thanks to the work of Van Tilburg and the Easter Island Statue Project, those mysteries are slowly being unraveled.